Program 306 – Historical Introduction | Wisdom of the Elders, Inc.
On October 23 rd, 1805, the sound of the falls beckoned to Lewis and Clark’s Corp of Discovery as they rowed down the quickening current of the Columbia toward what is today called Celilo Falls. 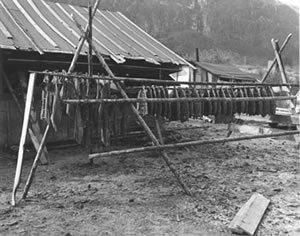 Salmon drying outside at Celilo Village, Oregon. Courtesy of the Army Corps of Engineers. Center for Columbia River History. At the head of the Columbia River Gorge, Celilo formed the upper part of a series of spectacular falls and canyons through an area we now call The Dalles. As James Ronda notes, these dramatic features, in combination with the warm dry winds of the Inland Plateau, created the most important fishing and trading complex in the Northwest. Migrating salmon resting in the pools and leaping the falls were caught by the thousands. The men fished from family owned platforms perched on the cliffs, pulling in the huge salmon with pole-mounted dip nets. The fish were systematically dried, pounded and stored in baskets by the women. Every year between the months of May and October, The Dalles-Celilo area filled with thousands of people from hundreds of miles away seeking to fish or trade. From the Pacific coast, Chinookian people came with shells and a variety of European goods purchased from British and American traders. Local Sahaptian tribes brought meat, dried roots and berries. Rocky Mountain tribes brought buffalo robes, horses and hide clothing. They all converged on the villages of the Wishram and the Wasco, to trade, gamble and socialize. With the signing of the Walla Walla Treaty of 1855, many of the tribes along the Columbia were moved to the timbered forests and rangelands 90 miles to the south. They were joined in 1879 by members of the Northern Paiute. 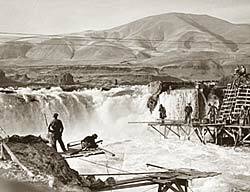 In 1956, the traditional fishing sites along the Columbia River were flooded by The Dalles Dam. It was a tragic loss for these nations. However, the Confederated Tribes of the Warm Springs Indians have graciously and courageously maintained their rich way of life, hunting deer and elk, fishing for salmon and eels, and gathering huckleberries and camas roots. Their 640,000 acre reservation runs along the Deschutes river up to the crest of the Cascade Mountain Range. Using their timber and agricultural resources, they have become good stewards of the land they now call home. In 1980, they purchased back a traditional fishing site along the Deschutes River. Also on the Deschutes, a hydro-electric project is now jointly owned and managed by the Warm Springs Tribes and a local power company. The Kahneeta High Desert Resort and Casino generates income and tourism. The tribe is positioned for a prosperous future but retains the values of its heritage. I’m Arlie Neskahi, and this is Wisdom of the Elders.